For most of their history Neanderthal technology was stuck in stasis1. Meanwhile, we were inventing all sorts of new exciting stuff. Perhaps Neanderthal hands were holding them back. See, your muscles grow and change depending on how you use them; altering the shape of the bone they attach to. However, the changes we’d expect to see as a result of the precision use are lacking in Neanderthal hands. Could it be that they weren’t as dexterous as us2? Some tool making techniques that require precision use of the thumb. Were Neanderthal hands incapable of this2? However, we can’t find an anatomical reason for this. Their bones and muscles were all in the right place2. Perhaps their brain was lagging behind, unable to control their hands as well as us. Or maybe, we just haven’t looked hard enough for evidence of their dexterity. Enter Karakostis and his colleagues, who believed the former was more likely. Particularly since we’ve been discovering Neanderthal technology was more complex than we thought. Clearly, they reasoned, Neanderthal hands must have had decent dexterity2. 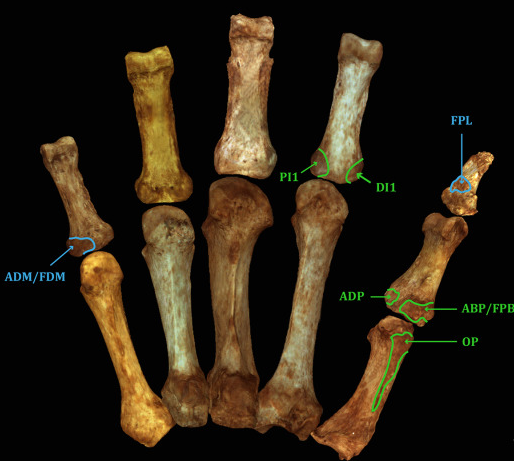 So if they’re right, what should the muscle attachment sites in the Neanderthal hand look like? Well, it turns a lot of the research on the subject is ambiguous. Whilst some found muscle use was influencing the hand bones in one way, other papers claimed there was no impact at all2. So they set out to try and settle this debate the only way scientists know how: with lots and lots of data. 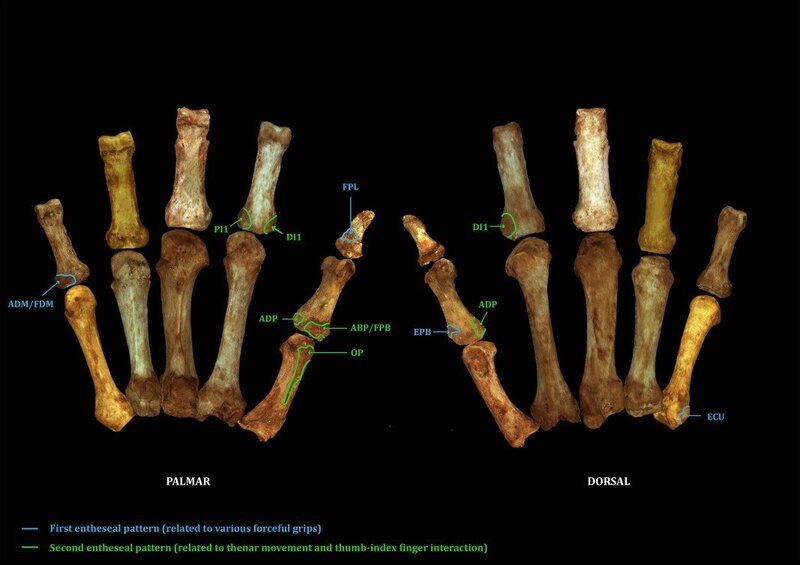 They went and found themselves a giant pile of hand bones and began thoroughly scanning their muscle attachment sites. This was then compared with the hand owner’s profession and how dexterous they were3. After carrying out the largest set of such comparisons ever, a trend emerged. It turns out there was a link between dexterity and attachment sites3. What’s more, Neanderthals have the same attachment patterns as humans. Clearly, they were as dexterous after all. In fact, they were using a precision grip more than contemporary humans2. Given all the great technology Neanderthals had, these results might not seem that surprising. Of course, they were great with their hands! Of course, they used precision grips a lot! However, as Karakostis and team put one mystery to bed another rises. Specifically, if they were great with their hands, how come their technology lagged behind humans? Clearly, anatomical differences – at least in the hands – can’t explain it. Maybe their brain just worked differently. Maybe their culture held them back. Or maybe their extinction meant they never got the chance. If they lived another few thousand years, who knows what they could have come up with4. Whatever the reason, we can at least wave goodbye to one hypothesis. Kuhn, S.L., 2013. Cultural transmission, institutional continuity and the persistence of the Mousterian. In Dynamics of Learning in Neanderthals and Modern Humans Volume 1 (pp. 105-113). Springer, Tokyo. Karakostis, F.A., Hotz, G., Tourloukis, V. and Harvati, K., 2018. 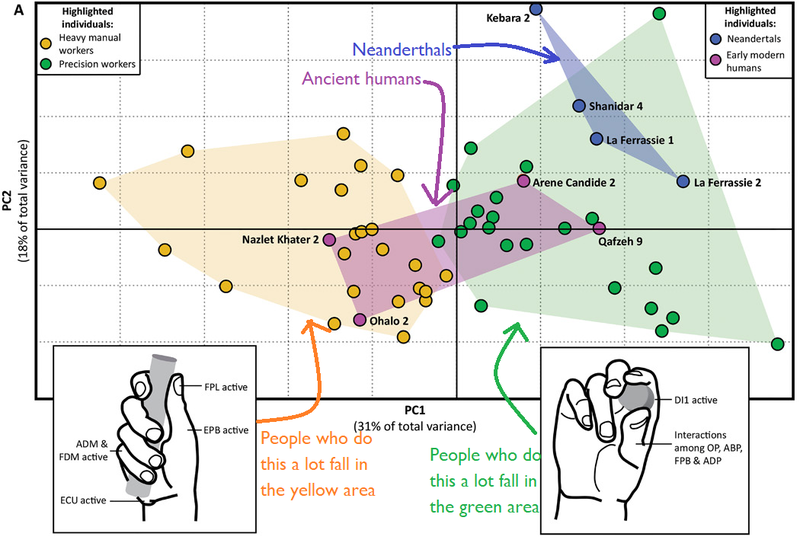 Evidence for precision grasping in Neandertal daily activities. Science advances, 4(9), p.eaat2369. Karakostis, F.A., Hotz, G., Scherf, H., Wahl, J. and Harvati, K., 2017. Occupational manual activity is reflected on the patterns among hand entheses. American journal of physical anthropology, 164(1), pp.30-40. Pearce, E., 2018. Neanderthals and Homo sapiens: Cognitively Different Kinds of Human?. In Evolution of Primate Social Cognition (pp. 181-196). Springer, Cham.